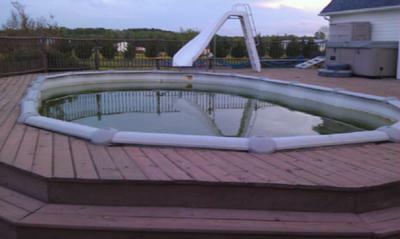 We're considering buying a used 18ft x 33ft x 52" oval Doughboy above ground pool. The owner says the model is a Club Pro, but I can't find that name associated with Doughboy. She bought it 3 yrs ago for about $7000 and is selling for $3000 including the decking. We'd need to burry the pool as our HOA doesn't allow above ground pools. The plan would be then build a deck around it. 1. Does this make sense to you, or are we better saving until we can put in an in ground pool (about $26-35K where we live). 2. If we bury it, do we go right up to the top, or do we need to leave some of it sticking out? Local Doughboy dealers have told me to bury it completely, to leave 6-8" out, and to leave 16-18" out. 3. This will be the 3rd summer for the liner. If it is a Doughboy liner, should we try to reuse it, or get a new one? If we try to reuse it, do we need to somehow keep it wet until we put it in? 4. A guesstimate on price to excavate and install the pool would be appreciated too. I have no idea what to expect! Thanks in advance and sorry if you answered this and I just didn't see it. Hi Ruth. It is not a Doughboy brand pool. They have never made that size. I'm not sure how they could have paid seven grand for the pool unless they are including the installation and possibly the decking. The decking alone may be worth three grand but the pool itself about a thousand. That's assuming it's in excellent condition, and it should be for only three years old. The equipment that goes with it gets taken into account also. A good sized sand filter in working condition is worth several hundred. If you include a pool cleaner, some pool steps, maybe a cover or two and anything else they may have, that could all be worth some good money. value is with a good quality used above ground pool. 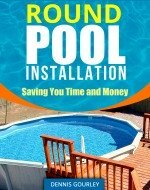 If you are going to have the pool installed I would find your installers and ask them about the pool. Is it a pool they feel they could move and install correctly? From the pictures I would have no problem with it. Provided the pool wall and bottom rails were not to severely rusted. Rust is something you need to check, but after only three years it should not be a problem. There is no way I would try to re-use the liner. It's just not worth it. They are plenty cheap enough online, there is no point in even trying to use the one that's in the pool now. It will shrink, it will be stained and ugly and stinky, you will never get the wrinkles out of the bottom, and on and on, don't even try. Especially since you are going into the ground with the pool. The dirt around the pool needs a couple of years to pack solid before you can drain the pool, so you are better off starting with a new liner, just to be sure. I recommend at least a foot out of the ground for an above ground pool. The water needs to be above the level of the dirt at all times. Your water level is usually about six inches below the top of the pool. If the water ever gets below the level of the dirt you run the risk of a cave in. If I were to contract that job here in Arizona it would probably go something like this. I would sub the decking out to a carpenter friend of mine who would probably charge a couple thousand in labor. I'm just guessing there but it looks like a lot of work. To take down, move and re-install the pool would cost about fifteen hundred in labor. On top of that you would have the cost of about five tons of sand, a new liner and a backhoe service. I would guess the excavation to be around five hundred. If this is all within your price range you may want to make a lower offer on the pool and see what they say. Wow! You are amazing. Thank you for the fast and informative answer. She said the pool is a Lomart and it does look like they make an 18 x 33'. But from what you've written in other threads (I finally found them! ), the brand isn't as important as hard packing the backfill. We finally found a local installer willing to talk with us. He is thoughtful but has not done an inground agp before. He suggested digging a hole wider than the pool, installing a french drain around the pool, and leaving an empty trench around the pool. We'll put deck over it so it wouldn't affect the function. He's essentially leaving the structure of the pool as it would be above ground. We've got pretty hard red clay in MD and it is plausible that the dirt around the pool would retain its shape/structure of years (?). I see where he's going with the suggestion but it seems that the backfill isn't that big a deal if you pack it and refill immediately when doing the liner change. Also, the pool we're looking at has an overlap liner (not beaded). Does that work with a buried pool if we're keeping 12" above ground as you recommend? Thanks! Also, if we do this we're definitely signing up for your hot line =). Thanks Ruth, I do try. I?m not seeing a Lomart pool there either. They do make that size but that does not look like one. And you are right, when buying used the brand is not that important. Yes, the overlap liner is great, and leaving a foot out of the ground allows for easy re-installs. 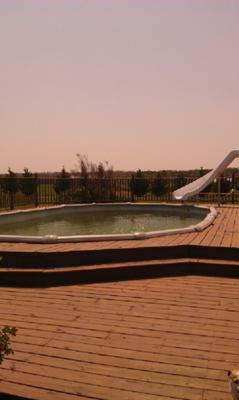 The problem with not backfilling is water sitting around the pool after a hard rain. The French drain is to take care of that, but where will the water go when the drain fills up? 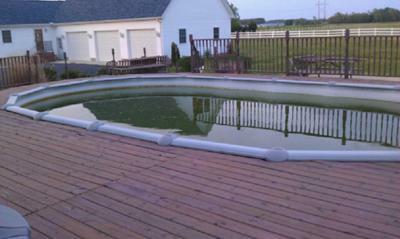 It will sit around the pool and cause problems. Your installer is right about digging the hole bigger than the pool. That?s really the only way to install them. Add three foot all the way around the pool when digging the hole. This make the installation go so much easier. Leave enough dirt on the property to backfill around the pool once it is full of water. Once it is full of water, free of leaks and the filter is operating properly. Only when you are absolutely sure everything is fine do you backfill.